Time for a new designThis new design fills the gap between the low power kick back and the direct drive desulfators and has features that a lot of you will like. I use the big blue cap (51,000uF), a power supply and low ohm resistors to simulate a battery. The following posts defines the parameters for the parts used in the Voltage Doubler desulfator.I tried to do away with inductors all together but I could not get the performance with out them. This circuit to me seems to have potential for motor run capacitors because of their very low ESR, it seems to me they would also store more energy than an electrolytic. Out of all the parts in the voltage double circuit, proper selection of the output capacitors will have the greatest effect on the output. I have been reading, I had no idea that the ESL of motor run caps was that high to effect the pulse like that. Here is an interesting article that makes a case for perhaps using smaller value film caps, say something in the 30uF range over 100uF Electrolytic. Terry What sets the lower limits of the amount of capacitance is how much voltage droop you can stand during the pulse. I picked up a few flashguns at a car boot for a pound each and most had 350v caps in at around 190-380uf, but I see I need bigger still! Anyone having problems stabilising the supply for the 555 as I had a problem a little while back with the current pulses. Sage Of course, either choosing an incorrect inductor or widening the pulse width to the point where the inductor saturates will cause a lot of heat to be generated. This is much more stable than using a real battery,and I can change the "internal resistance" very easily. When the Mosfet turns on the capacitors are now in series, generating a high current 24 volt potential that discharges into the battery. The diodes across the inductors greatly reduces the peak voltage the Mosfet sees when they turn off. 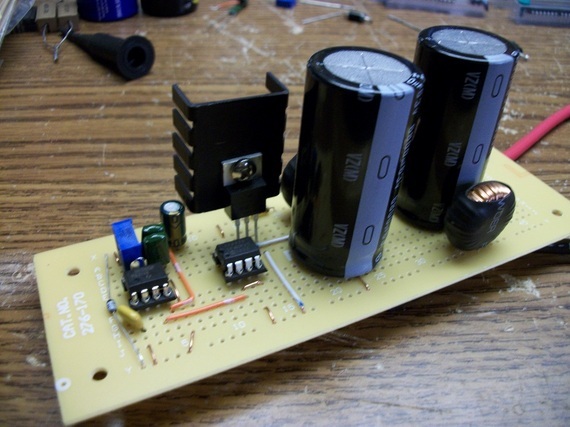 First let me say that the voltage doubler design is the most viable design on the forum to date. Dropping 8 volts between the board and the battery means you are putting out a lot of pulse current.The output voltage "droop" across the pulse indicates a lot of current being drawn from the caps. I'm new to this forum and I've reading with great interest almost everyting I can find here since I have several battery that require help. I guess as long as the MOSFET is not energized for an excessive amount of time everything will be fine but it seems to me if you extend the on-time pulse width past a certain point (saturation time of the inductors) the two inductors and the mosfet become a direct short across the battery. The cap that produced to highest output and the best pulse shape was the 6800uF 63V large electrolytic ($4.20 Digikey price). Beef up the electrical path through the battery, caps, and Mosfet to get the maximum pulse power to the battery. Heaven forbit the mosfet fails "on" or someone gets the idea to extrend the pulse width considerably. The desulfating pulse voltage will always be double the battery voltage minus resistive losses (ESR, on resistance,etc.) As the battery voltage rises so will the output of this circuit. This is such a long time that there is no inductance involved, just the coil resistance, which is very low.2. Then when the Mosfet fires, the inductors will exhibit a very high resistance because the voltages are changing very fast. They all worked well.The hand wound inductors that did not work well were the high permiability cores. 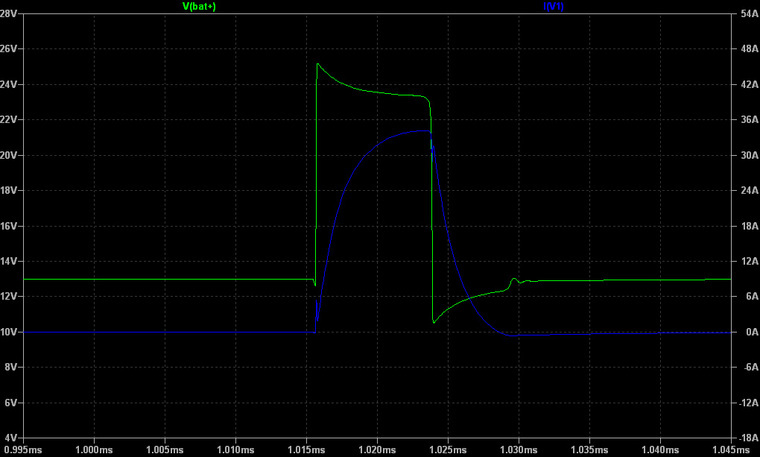 Without the diodes the battery will see a short reversal of current when the Mosfets turn off.3. If you change to the larger Jameco inductor and see an improvement (less droop, less current draw) then that would be a good thing to know. I hadn't really noticed, but now that I look carefully, many of the circuits have the same issue it exists even in the old kickback desulphator. Apparently your're supposed to put one of these monsters across your audio system power feed to supply power during those big window popping bass notes. The only time I ran into problems with these inductors is when I used high permeablity cores and they saturated. Thus a few will placed fuses, say in series with the inductors, would greatly limit the damage.Sage, most of the circuits you see on this forum are "concept designs". When something used to go in the HV section it usually meant a lot of stuff had to be replaced. They demonstrate a desulfating method but do not have the finishing touches and safeguards required to be a product. When the Mosfets turn on the inductors basically disappear from the circuit and the caps are now in series. Still I am impressed that they did as well as they did.An odd thing about the run caps is that I could plainly hear them "singing" the 1700 Hz rate. This is based on my circuit that draws about .4 amps with a 1700 Hz, 7uS, 30 amp output pulse. This circuit puts out ten times the pulse current so it should draw ten times the average current. Look at the scope photos in the previous post of the voltage wavefrom of the 100 uF and 2200 uF caps. It does not matter if they are Ferrite or Powdered Iron.Radio Shack sells a 150 uH choke that would work just fine. Battery tester that can percent threshold. Brand, model and part number of your device. Stands for off automatically when.